This fun Easter egg smoothie popsicle recipe is a quick way to add a little colorful fun to your holiday. 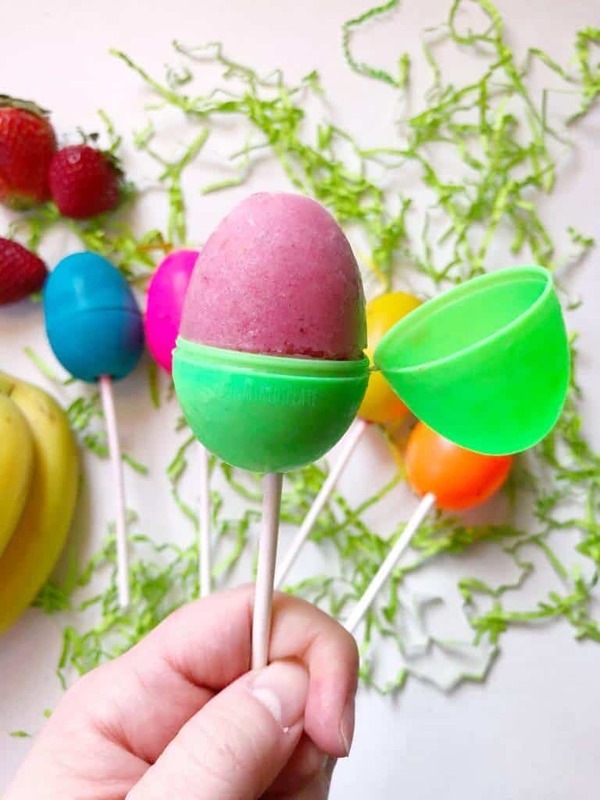 Made of only fruit and coconut milk, you can totally be the fun mom with these treats and serve these Easter egg popsicles with breakfast! These treats are healthy, cute and a simple way to surprise your kids. *This post may contain affiliate links that will help you create this idea even easier, but also give me a small commission at no cost to you if you choose to purchase. 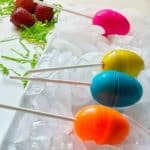 My kiddo had not even tasted this Easter egg smoothie popsicle recipe before she asked if we could make them an Easter tradition. I guess everything on a stick is better right? These little Easter egg lollies just add so much color and fun. serve them to a group, or pop one out of the freezer one or three at a time for your kids. So if you don’t know the mom hack all you have to do is simply run your homemade popsicle under a bit of warm water for a few seconds, and they should pop right out. Not too long because of course then you would have slurry again, but just a few seconds and the pop comes right out easy peasy. This warm water trick is especially important for these Easter egg smoothie popsicles. The shape of the eggs mixed with the liquid inside expanding and the popsicle is going to be hard to open. I gave mine a good yank open thinking the eggs would just pop open, but they don’t. 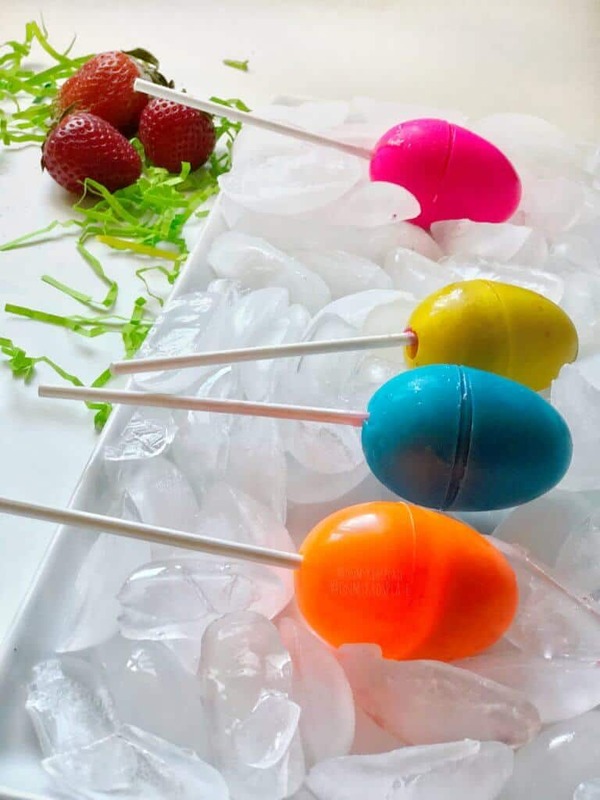 A few seconds of warm water will make you supermom as the kids are jumping up and down wanting one of these Easter pops! a squeeze bottle– I found mine at the dollar store but I linked to one on Amazon in case you need one. Most plastic easter eggs are not recyclable and let’s be honest they are everywhere. 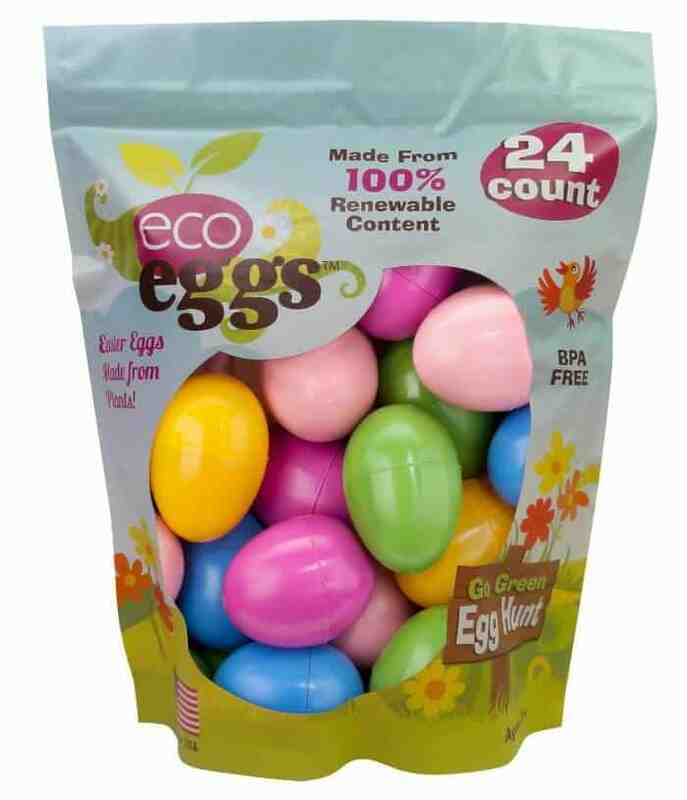 This project is a way to reuse those eggs. 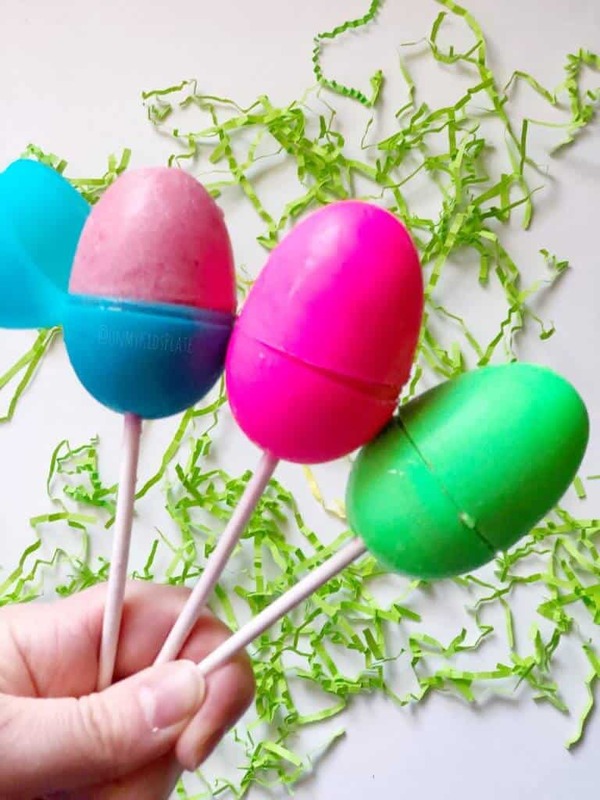 If you are looking for alternatives, or are looking for other ways to make these eggs, here are a few more ideas to swap out for this activity. Can I Use Anything Else To Make An Egg Shaped Popsicle? 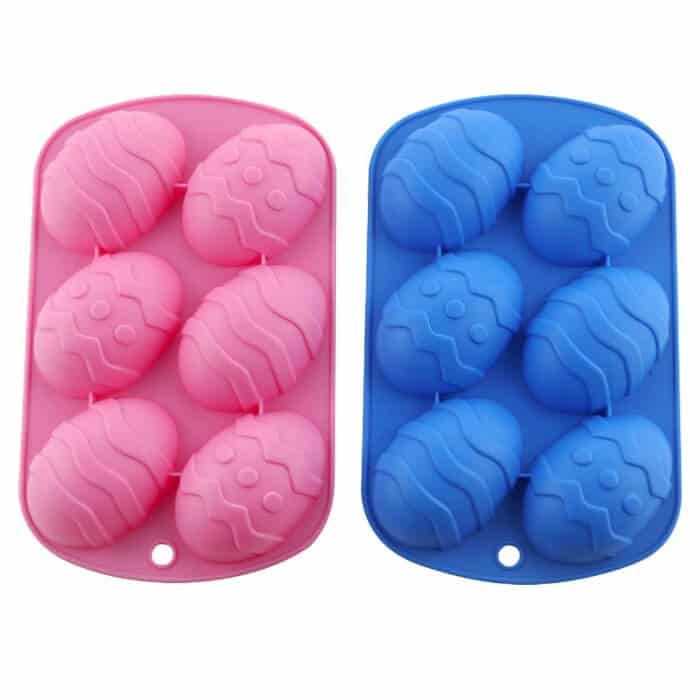 You could also use a silicone egg mold like this one which has a fun design also. These pans can be used for other treats too, you’d just need to add a stick before freezing. In a blender, blend strawberries, coconut milk and banana until liquidy with no chunks of fruit. Line up your eggs so the pointies side of the eggs face down. Using a chopstick or a pen, poke a hole in each plastic egg on the wider side of the egg. Wash well after. Fill a squeeze bottle with smoothie mix. Make sure your eggs are closed tightly, then carefully fill each Easter egg with the smoothie mixture. Add a lollipop stick to each egg in the hole in the egg. Freeze Easter Egg Smoothie Popsicles for a minimum of six hours, preferably overnight! Tap This Image To Pin It For Later!